The quest for freedom has always been as much a battle of ideas as it is a popular struggle. Classical liberal pioneers such as John Locke and Adam Smith stressed the inherent worth of the individual, inalienable rights, and the benevolent consequences of the cooperative, peaceful pursuit of one's own happiness. These ideas became the intellectual scaffolding for much of the West's most fundamental institutions and achievements. Yet after its 19th-century high-water mark, classical liberalism lost much of its passion, focus, and popular support. Intellectual trends increasingly began to support coercive egalitarianism, empire, and central planning at the expense of individual liberty, personal responsibility, private property, natural law, and free institutions.But the eclipse of classical liberalism by contemporary liberalism and conservatism is passing. 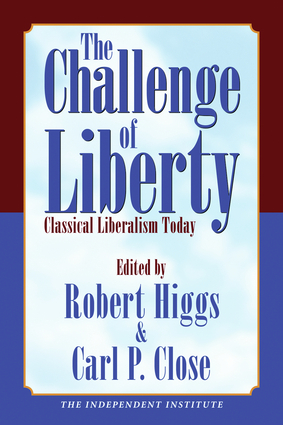 The Challenge of Liberty restores the ideas and ideals of classical liberalism and shows how its contemporary exponents defend such pillars of free societies as individual rights, human dignity, market processes, and the rule of law. Robert Higgs is senior fellow at the Independent Institute and editor of their quarterly journal The Independent Review. Carl P. Close is director of academic affairs at the Independent Institute and assistant editor of The Independent Review.